DQ has gone to court to prevent a small California frozen yogurt chain, Yogubliz, from selling their 'Blizzberry' froyo because the name is too similar to DQ's Blizzard soft-serve ice cream and candy dessert. "Yogubliz chose a term whose only significance is a shortened form of Blizzard, Yogubliz did so with every intention of trading on the fame and goodwill of Dairy Queen's mark." 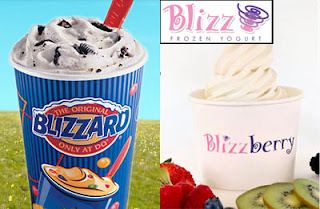 Dairy Queen says Blizzard is its most popular menu item and generates $750 million in sales a year and that 1.5 billion Blizzard treats have been sold since 1985. Blizz Frozen Yogurt has 11 locations in California and Nevada, but is looking to expand and offering franchise opportunities.